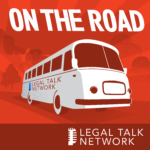 Legal Talk Network is a podcast network for legal professionals with hosts from well-known organizations and brands in legal. Over 20 active podcasts cover important legal news and developments, including access to justice, law school, industry events, legal technology, and the future of law. The Summit on Legal Innovation and Disruption (SOLID) looked at the future of legal services from a practical perspective. We covered the conference with some great legal innovation interviews. New hosts Gyi Tsakalakis and Kelly Street bring big-name guests and modern digital marketing topics to this relaunched Legal Talk Network podcast. In this monthly podcast, host Ken White will bring history to life by weaving together real cases, voice acting, real accounts from real people, in this story telling narrative about our freedom of speech.